10/29/2012 – Again and again, the Thecus® N5550 gets the spotlight shined on it once again. Techgage from the US gets their hands on one unit and uses Intel NASPT and real-world tests to distinguish real performance. The N5550 has an Intel® Atom™ processor inside with 2GB of RAM to power it through large file transfers. 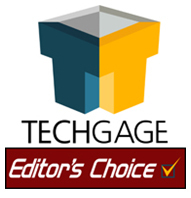 Benchmark results are fantastic and Techgage loves it so much they gave it “Editor's Choice” award. High-performing, thanks in part to the fast Intel® Atom™ CPU and 2GB of RAM. Quiet-running, nothing compared to a standard desktop PC. USB 3.0 support and 4 x USB 2.0 ports at the back. Includes HDMI-out to use the NAS as a light PC or media center (both require modules to be installed). Included copy of Acronis True Image (which we highly recommend for backup). Let's jump straight into raw facts, Techgage uses two methods of benchmarking the N5550, Intel NASPT and their own “Real-World” teaching method. This way they can make a better comparison and have a clearer understanding of what the 5-bay from Thecus® can really accomplish. “These are some great performance results, with some actually topping out the theoretical limit of our gigabit network (125MB/s).” says Techgage. 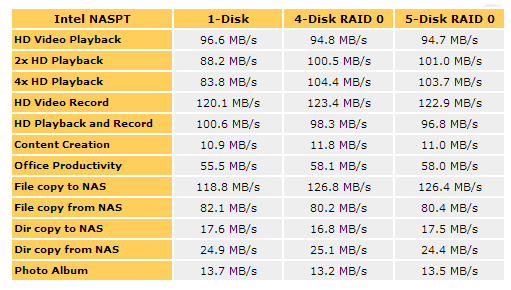 “Note: The broken RAID 5 results represent a 4-Disk array with one disk removed. The N5550 comes with a wide range of modules and specs that are highly customizable. For instance, McAfee Antivirus is free of charge so users won't have to stress about sensitive data being corrupted. For local and remote backup, Data Guard module is offered to make managing your NAS and daily file backups quick and easy. Since cloud access is such popularity these days, T-OnTheGo™ supplies personal cloud access to your own NAS. Have the availability to upload, download and even stream multimedia via T-OnTheGo. Multimedia has become a norm in the storage industry, many people can see more and more devices pop up left and right with these features. However, Thecus® is the pioneer for incorporating HDMI output on NAS systems. With the newest firmware, ThecusOS 5.0, multimedia playback is easy. In addition, with remote application about for mobile devices, such as HippoRemote and Valence, users NAS experience is pure perfection. Established in 2004, Thecus Technology Corp provides market leading network attached storage and network video recorder solutions, committed to revolutionize how everyone from home user to enterprise level business centrally stores, manages and accesses their digital data both onsite and cloud-based. Thecus strives to deliver continuous innovation through cutting edge technology and design to provide data storage with the most customer-friendly platform, rapid performance and robust security. In May 2016, Thecus was formally acquired by Ennoconn Corporation and thus became part of the Foxconn IPC Technology group. Partnered together this diverse group of companies work in tandem to provide a total IoT (Internet of Things) solution. Now with an unparalleled portfolio to work with, Thecus is collaborating to bring unprecedented change to the network storage industry.